The Love Activated Phi is a highly creative symbol which represents the flow of light, energy, information. I work with this symbol extensively and wanted to share some thoughts about it. I find many people look at it with instant recognition, so I invite your responses in the comments section. 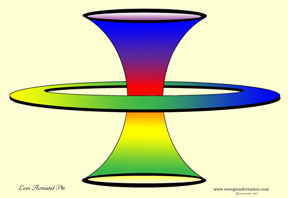 As shown in the image, a funnel shape leads down to the center from the top, and an equivalent funnel leads up to the center from the bottom. These are the vertical energies and can bring information from the galactic center above or from the core of the earth below. In the drawing, the horizontal plane is shown as being flat, but when I work with the symbol, that flat plane is actually a torus, a doughnut shape. This brings the vertical energies into the horizontal realm, our day to day interactions in physical life. I often see this occurring first in the heart and then spreading outward. I originally drew this symbol as a logo for Crystalline Consciousness Technique™, but it did not want to be a logo, so that phase quickly passed. The symbol has life and movement of its own, the funnels and torus are dynamic and active when in use. When I want to gather information, I often meditate on the symbol in a CCT session. Huge amounts of information then move into my awareness rapidly. This also is a highly energized process and I do not feel tired or drained afterwards. The Love Activated Phi also is a potent tool to improve clarity of communications when I do a CCT session for myself and other people. Since CCT itself removes distortion from our energies, the combination with this symbol is highly effective. If you have instant recognition of this symbol I would be interested in hearing about it. I also would like to hear any responses to the symbol or experiences with it from any of you who are willing to share here. This image is available as a laminated poster for $25. Please email me if you wish to purchase the poster. Thanks! I reccommend you go read the rest of the articles as they offer wonderful reading! This entry was posted in Creative Healing and tagged love activated phi, symbol on July 22, 2007 by Lexi Sundell.